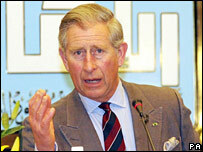 The meaning of God's word must be interpreted "for this time" as well as "for all time", Prince Charles has said in a speech to an Islamic university. He became the first westerner to address the Imam Muhammad bin Saud University, in Saudi Arabia, which has worked to counter radicalisation. Last week, in a speech to Egyptian scholars he talked about the row over cartoons of the Prophet Muhammad. It showed the danger "of our failure to listen" to others' views, he said. The prince and the Duchess of Cornwall are in Riyadh as part of a two-week tour of the Middle East. In his speech at the university, the prince spoke about the importance of interpreting religious texts. "I think we need to recover the depth, the subtlety, the generosity of imagination, the respect for wisdom that so marked Islam in its great ages," he said. "Islam called Jews and Christians the peoples of the book, because they, like Muslims, are a part of a religion of sacred texts." The "great ages of faith" understood "the art of interpretation of sacred texts between the meaning of God's word for all time and its meaning for this time", he added. He repeated the message of greater tolerance delivered earlier this week at the Al-Azhar mosque in Egypt. "We should do all we can to overcome the distrust that poisons so many people's lives," he said. That the prince had delivered a speech in such a prominent Islamic institution meant Muslims would "remember this for years", a British embassy spokesman said. The duchess, meanwhile, saw the hidden side of Saudi Arabia when she met some of the kingdom's princesses and local women. She was shown the work of a charity which aims to empower and support women. The women remove their black Abayas - head-to-toe gowns - while they are at the male-free centre in Riyadh. The Al-Nahda Philanthropic Society was set up more than 40 years ago. On Saturday night Camilla will attend a women-only dinner hosted by Princess Moudi while Charles will spend the evening with the royal Saudi men. Security for the two-day stay in Riyadh is intense with westerners having frequently been targeted in the region. The Foreign Office has warned of a high threat of terrorist attacks. Thirty-five people were killed by suicide bombers in 2003 at housing compounds in Riyadh.